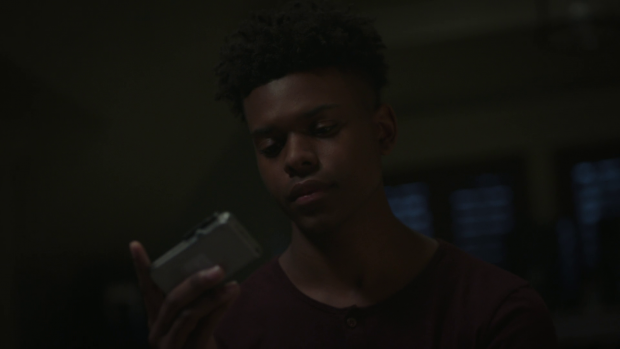 Marvel’s Cloak & Dagger focuses on the connection between fathers and daughters when Tandy and Tyrone go into the mind of Ivan Hess. This show is an interesting one in terms of how it is put together. Tyrone and Tandy’s powers offer unique opportunities to break away from linear storytelling and explore more abstract concepts. This means that it’s possible to tell stories about the characters using their talents to investigate very real things like drug dealers or crooked cops can easily be combined with seeing manifestations of the hopes and fears of various people without either of them feeling out of place. The previous episode was a very traditional one in that it showed Tandy and Tyrone working different angles to get answers. This episode essentially takes the form of a time loop though takes place inside the mind of Ivan Hess. He has been in a catatonic state since the rig exploded 8 years ago and it turns out that he is reliving the few minutes leading up to the accident over and over again while being unable to make any changes. Ivan is very much defined by loss in this episode. The explosion was a life altering event in the sense that everyone he worked with was killed and everything he worked for was lost. When we first see Ivan in this episode he has lost his sense of identity though seems oddly optimistic about it. Tandy and Tyrone represent a change in the norm for him and it could be that this brings him hope initially though he still has no idea who he is and is completely resigned to being stuck in this loop forever. There’s nothing subtle about this episode though that isn’t a bad thing because it’s clear what it sets out to achieve and the focus is on how the characters react to the situation rather than trying to do something innovative with the time loop concept. It could be seen that Ivan blames himself for the accident or feels guilty for being the only survivor which could be the psychological reason for him being unable to put it behind him and get on with his life. He’s trapped within himself because he keeps going over the accident in his mind and sees his current situation as the punishment he deserves. The episode doesn’t necessarily tell us this but it’s definitely worth considering especially when Tandy and Tyrone blame themselves for the things that have happened in their lives that aren’t necessarily their fault. Initially Tandy and Tyrone approach the situation from a logical point of view and think that all they have to do is follow the rig’s emergency procedures to prevent the destruction and allow Ivan to wake up. This was never going to work because the scenario is clearly about Ivan wanting to break the loop and return to the real world. Once again the storytelling isn’t subtle but that doesn’t mean it isn’t effective. 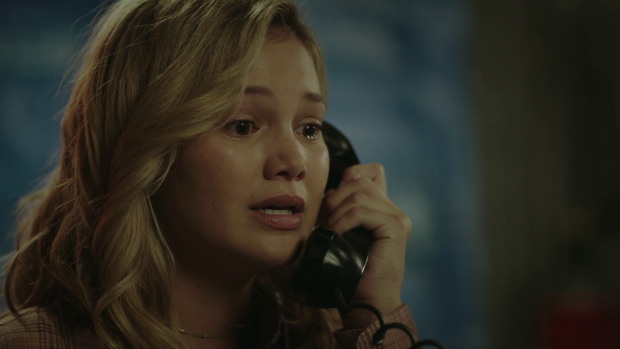 Tandy becomes distracted from this plan by hearing the voice of her father during a phone call that happens once per loop. Of course it isn’t really her father nor is it even her memory of her father. The situation is made up entirely of Ivan’s memory so the version of Tandy’s father that exists within that is entirely based on how Ivan remembers him. This means that the interaction is limited because there’s a lot about him that Ivan doesn’t know. Combine this with the specific purpose of the phone call and there’s limited scope for a meaningful conversation. This doesn’t seem to matter to Tandy too much because she is so blind sided by hearing her father’s voice that she can’t be rational about it. She is willing to remain stuck in the time loop so she can continue to hear her father’s voice and vary the conversation as much as she can. Her commitment to doing this is so strong that she lies to Tyrone about leaving Ivan’s mind and lets him go while she continues to relive the loop just so she can continue having those precious seconds hearing her father’s voice. This basically amounts to a comfortable delusion for Tandy where facing the truth doesn’t seem like an attractive alternative. This gives us an idea of how Ivan became stuck in the loop even though the motivation is very different. The idea that the loop is safe and comfortable carries through both Tandy and Ivan so it’s easy to see why giving up would be a tempting prospect. Tyrone is exempt from any temptation because he doesn’t have the same kind of connection to these events. His brother was killed at this point in time but that has nothing to do with this particular scenario other than it happened at the same time. He has no way of interacting with a representation of his brother because Ivan would have no way of knowing him. Tandy’s father can speak to her because the phone call happened but he had no awareness of Tyrone or his brother so it doesn’t factor in. This allows Tyrone to view the situation more objectively and be the voice of reason who urges Tandy to snap out of what she has surrendered to. At first he tries more brute force methods such as cutting off the call or unplugging the phone but Tandy takes comfort in the fact that she will have infinite opportunities to hear her father’s voice in subsequent loops. It isn’t until Tyrone challenges her to realise that what she is experiencing isn’t real. It is achieved by asking a simple question that Ivan wouldn’t know the answer to. Tandy asks her father who is sitting in the back of his car and he doesn’t have the right answer because it wasn’t information that Ivan has access to. It’s a simple and powerful display of realisation on Tandy’s part as she is shaken out of her delusion and forced to experience harsh reality once again. Beneath the surface of Tandy’s delusion is her deep seated insecurities that continue to define both who she is and her attitude to the world around her. In her mind she has nothing in terms of family, friends or prospects so feels worthless. She also has a really low opinion of herself shown when she turns Tyrone’s reassurance back on him by telling him that it was her skills at manipulation that made him help her rather than friendship. This further reinforces that Tandy’s confidence is a front and that Tyrone can show her what genuine friendship is. Ivan is snapped out of his own delusion in a similar way. Tandy is able to force him to consider reality through Mina’s cookies. They are part of every loop but he doesn’t think about them or consider where they come from. All it takes is Tandy pointing them out to make him remember his daughter and want to get back to her. From here the original mechanical plan to stop the explosion is in play again with the notable difference of Ivan being involved and wanting to wake up which means that it works where it doesn’t before. 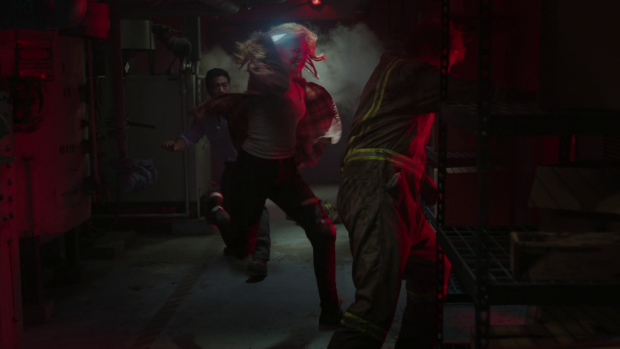 The violent zombified rig workers allows for Tandy and Tyrone to fight alongside one another using their powers and it’s great to see. It shows that they are starting to embrace their connection and work as a team. Hopefully it’s a sign of things to come because it shows how these powers can be used in a more action drive context. Things are looking up when Ivan wakes up as he reunites with Mina in a really well delivered moment showing a family brought back together. It’s perhaps a little neat and tidy given that Ivan hasn’t seen Mina since she was a a teenager but as a moment it does work and it serves the important purpose of bringing something into the show that can oppose Roxxon. What will happen from here is anyone’s guess but I’d be surprised if Roxxon didn’t react to Ivan being back in the picture. This experience clearly marks a turning point for Tandy. She returns to her church alone but secure in the knowledge that she’s anything but at this point. Tyrone is clearly someone she can count on, Mina shares a lot of her values and Ivan represents a tangible connection to her father that she can use in the coming episodes. Tyrone proves how genuine he is by calling her to let her share in a really personal moment involving him listening to a recording of his brother so that he can experience hearing his brother’s voice. It has been established that he can’t remember what it sounds like so this represents real vulnerability for him and letting Tandy share in that shows that he recognises her as someone who understands what he’s going through, values her input and genuinely wants her to realise that she’s not alone. It’s a great moment played well by both actors and really moves the characters forward both individually and as a connected pair. As good as it was this episode also feels somewhat isolated in terms of the overall plot of the season. The only thing that moves forward is the recently introduced thread of Ivan being in a catatonic state. Nothing else really moves meaning that there’s less time in the season to start wrapping things up. Making this a more contained story was absolutely the right thing to do in context of what happens to the characters in this episode but it also means that the season loses momentum because little effort is made to connect it to the overall narrative. A strong character driven episode that makes good use of the time loop concept. In this case the loop is in the mind of Ivan and drags Tandy and Tyrone into it. Framing it around the rig explosion is a good idea because it’s a defining event in the show itself. It shows how Ivan is defined by the loss experienced during the accident and ties into Tandy specifically because her father was part of those events. Having Tandy sucked into the loop when she hears her father’s voice works really well as it causes her to abandon reality while Tyrone tries to snap her out of it. Nothing that goes on here is subtle but it’s used well such as Tyrone challenging Tandy to ask a simple question as a reminder of how none of this is real. It works and Ivan is woken up in a similar way by questioning where the cookies come from. The reunion between Ivan and Mina works well as a moment though ignores the fact that Mina is quite a bit older since Ivan last saw him. Ivan waking up brings in another element to the Roxxon plot. It’s clear he will be important and that Roxxon won’t just leave him alone considering everything knows. This episode is light on overall plot and causes loss to the momentum of the season but the way it makes use of Tandy’s insecurities and low opinion of herself to develop the growing friendship between her and Tyrone when he proves to her that he is a friend she can trust is great. Tyrone choosing to share the moment he hears his brother’s recorded voice with her is powerful and wonderfully acted further reinforcing that this show is all about the characters.